This lovely early "Surprise Egg" was made by Stuart Devlin in 1967. 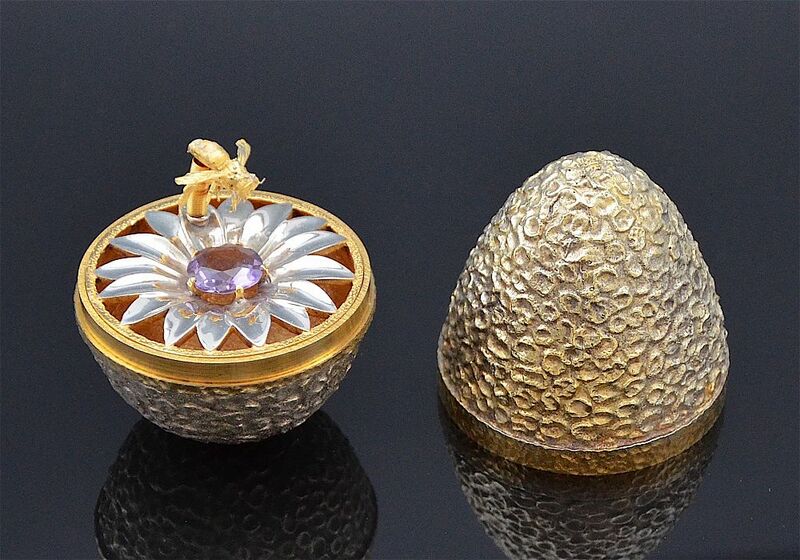 The solid gilded textured egg opens to reveal a silver flower with a faceted round amethyst above which hovers a gilded bee on a gilded spring. The case is hallmarked by the London Assay Office for silver and 1967 and has the sponsor's mark "SD" for Stuart Devlin. It is numbered "56" and is presented in a black box with a red silk & velvet lining . The presentation booklet confirms that it is a limited edition being no. 56 of 85. This is one of the nicest Surprise Eggs that we have had.